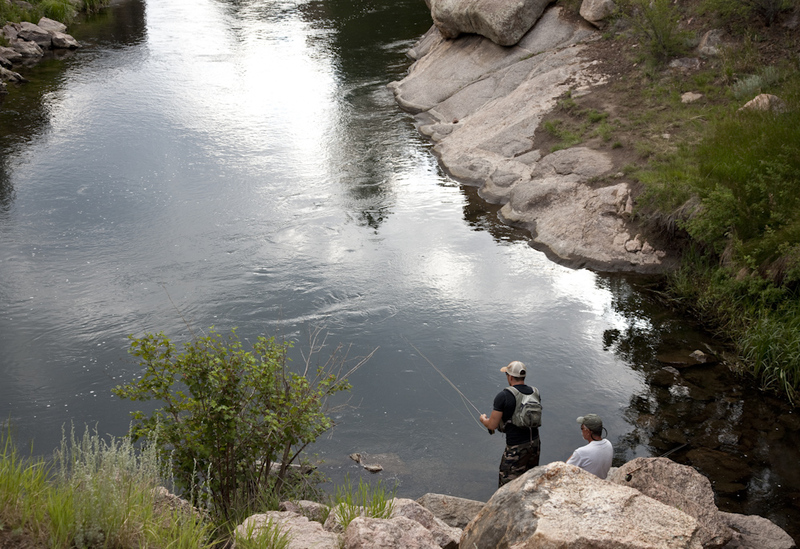 For me, the introduction to fly fishing came from my dad. For others I know, it has come from friends or family, books or TV shows, or of course the internet. For a great number of freshwater anglers, we wish we could fish every waking moment but life gets in the way and we have to make special trips when we are afforded the opportunity to take a trip. If you enjoy casting a lure into a stream, float fishing with bait on a lake, or jigging a soft plastic from a river bank, you will probably love fly fishing. 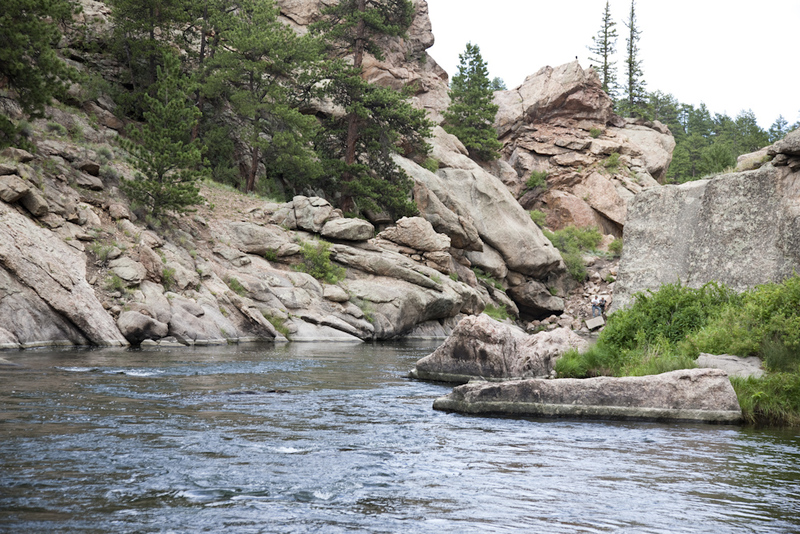 I wanted to share my thoughts on everything I learned when I first started fly fishing. So… Here’s what you’ll need. 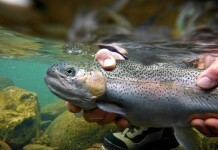 Obviously, you’ll need to start by getting your hands on a fly rod. The best (and usually most expensive) fly rods are perfectly balanced and carefully designed to be incredibly responsive to your every movement and allow for maximum accuracy when casting. This may not actually be ideal for a beginner, as it means that every mistake you make (and there will be many) is amplified. 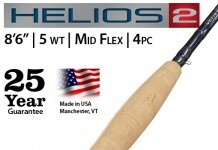 A mid-range rod will be much more forgiving and still offers great quality. Stay away from the super cheap, department store, too-good-to-be-true $20 rods, because that’s exactly what they are. You can find perfectly good beginner rod and reel combos at your local Cabela’s or Bass Pro Shop that won’t leave you broke and shopping there will remove the problem of finding a reel that matches the size and weight of your new rod. To be honest though.. I like supporting true fly fishing shops and not the monster chains. 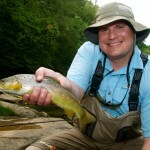 I would suggest a Redington Path Outfit from FishWest.com or a Redington Crosswater Fly Fishing Outfit (if you are looking for an inexpensive option). If you want to go full out for a cool rig, check out the fly fishing reviews section of this site and choose the best option. I would recommend a 5 or 6 weight to start as that is an in between size and will cover most situations as a beginner. As for fly line, make sure you have the corresponding amount of backing that your reel holds, and line that is the right weight for your rod and reel. 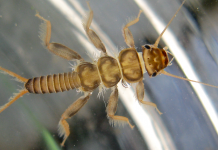 You will also need a few spare tippets and leaders, and it’s good to have a few different types of these (such as floating versus sinking leaders) to suit the different types of fly fishing you may be doing. 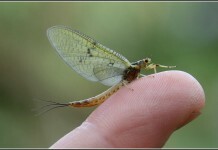 Fly fishing is all about matching the hatch. 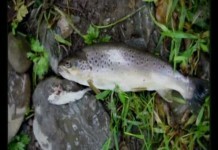 (basically) The best thing to do is to research online what it is that the freshwater species in your local streams, rivers or lakes are feeding on at the specific time of year that you are going to start fishing. 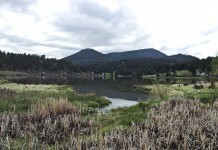 If you can find a local online forum where fly anglers are discussing recent hatches or feeding patterns, this will serve you well. 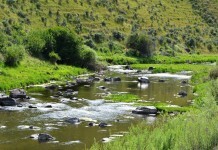 Do your best to find corresponding flies, and head to the river. 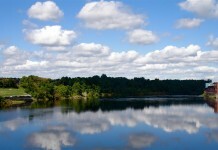 When you start fishing, look around you on the water and in the air and see what you can see. Hopefully there’s something that looks like your fly there, and if not, open your fly case and find something that looks vaguely similar to what you see. Be aware that different insects hatch at different times of the day, so be sure to keep a close eye on what is happening around you. To start out, I would invest in a couple of patterns to get you started. 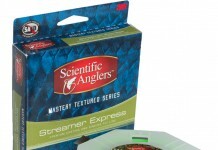 You can save money by buying staple patterns online and buy specialty patterns at the local area fly shop. 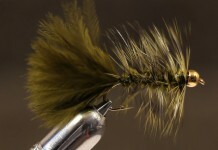 I got into fly tying personally and find it to be almost as enjoyable as fly fishing. 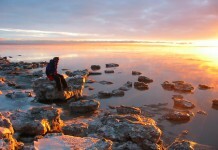 I highly recommend it if you are looking for a cool but expensive hobby. 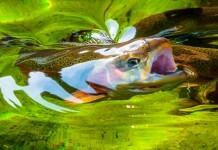 If you’re transitioning into fly fishing from other forms of fishing, you probably already have a lot of basic fishing equipment such as a knife, line clippers, and a camera to get some great shots to put up on Facebook. 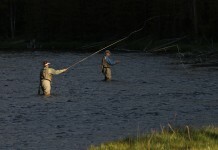 However, there are some items that are especially important for fly fishing. These include a vest with an infinite number of pockets to accommodate the excessive number of fly boxes you will soon accumulate, and a eco/fish friendly net (it doesn’t have to be huge) to help land your catch as this is more difficult when fly fishing. You’ll also need a good pair of polarized sunglasses, partly to help you see the fish in the water and partly to protect your eyes from the helpless flailings you will initially call your cast. I have seen some nasty eye wounds from hooks so glasses are a must. I also recommend barbless hooks. It makes it more sporting and it extremely easy to remove hooks from your skin. Trust me on that one.. Removing a barbless hook is relatively painless process.. Removing a barbed hook hurts. 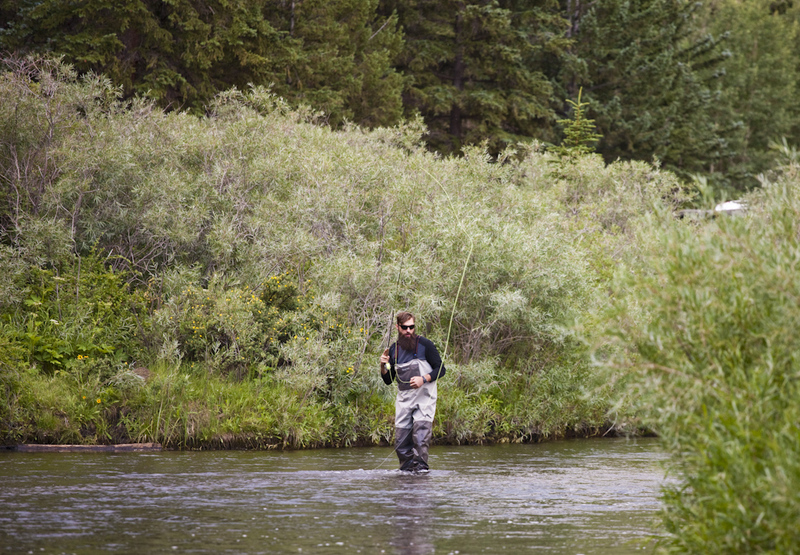 A good pair of waders is also a must have if you don’t have some already. Definitely buy a good pair of waders.. My first pair were cheap and fell apart after three trips and the store wouldn’t let me return them so I had to eat that money. I recommend Simms, Redington, or Patagonia brands. They are amazing and will last forever. 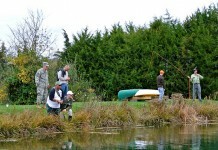 If you are going to get into fly fishing.. don’t skimp on the waders. Trust me. Armed with these items, a positive attitude, and maybe an instructional DVD or two, you’re probably ready to start your journey into the land of the fly. Enjoy yourself, and don’t look back, except when you back-cast your fly into a tree. 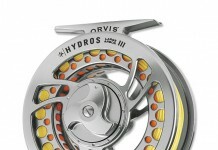 Another resource is to check out Orvis online. Tom Rosenbauer is a great instructor. Watch these videos first: http://howtoflyfish.orvis.com/ This will help you understand what you are about to do and then call your local fly shop to find out if they offer free lessons. A number of stores offer free fly fishing lessons to get you in the store so call around until you find one that offers free lessons and you are on your way.